Allowing our young to experiment with hands on is the best path to understanding. Theories and facts can be memorized and regurgitated but that does not mean they are understood. William Lovell | c-Link Systems, Inc.
09/05/14, 08:09 AM | Industrial Robotics | c-Link Systems, Inc. Humanity progresses with each generation and so does its technology. In all this progress we find ourselves in the quandary of how to educate our young. Today’s young people grow-up with advanced technology within their grasp if not already in their hands. The innovative teacher looks at the world to observe what these young people are playing with and utilizes it to help educate them. Within the following paper is just one such approach to help the process along. The conventional approach to teaching some subjects is not as effective as other methods. Having spent time utilizing the “old school” approach with high school students I reverted to a military approach. I didn’t have to holler at the top of my lungs, well once to get everyone’s attention and that also ended up including the class in the next room over. We went to total hands on with a minimum of “chalk board” time, the only white board time was for explaining an asked question or process/procedure review. After-school programs for middle school students become an even greater challenge with time constrains in hours per week and budgets. After looking at the conundrum for the last 6 months I believe we have a solution that could in old school parlance “rock the house”. We will use; a computer game that all of the middle school students would show me their progress in, robotic vehicles made for outdoors and a big sand pile. The program is an attempt to teach math, basic materials science, robotic motion, creativity, team work and safety in the work place. We start with a computer game called Minecraft. The version is actually MinecraftEDU; this package has a large educator backing and utilization. It is low cost in comparison to other STEM or robotic packages. Because this is a pilot program and a work in progress it will be limited in size and scope. Figure 1 contains the basic configuration for this work. 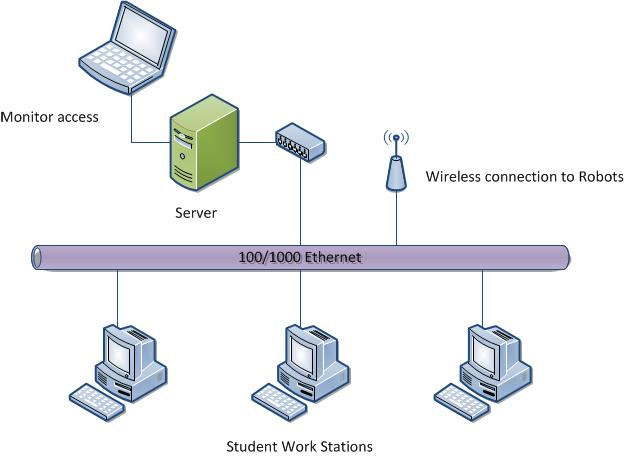 The system is built around a low end server (unless you really think you will have a hundred students on at a time), a network hub, currently 3 PCs and a wireless connection. For this model the hub and wireless connection can be a single unit. A port for laptop connection on the server allows an instructor access to progress and the ability to build in problems for solution. NOTE no connection to the internet. The software is in two sections; a server side for holding pre-made models, setting up problems and looking at progress, the PC side is for the student work station. This all coupled with robots. Figure 1 Classroom computer configuration. 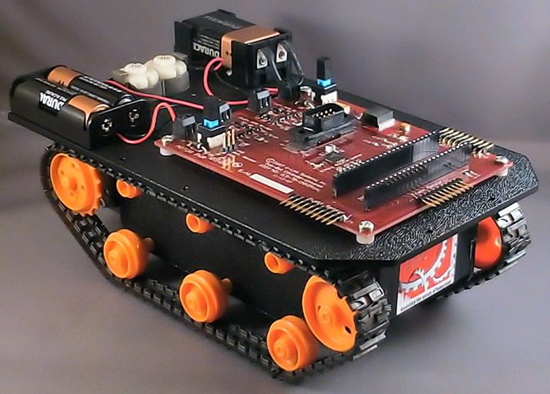 Figure 2 Early Trak-Bot, not capable of attachment modules. 1. A bulldozer blade with rise/lower function and possibly a blade tilt function. 2. A 3D printing module which contains; five Degree-of-Freedom (5-DoF) arm that controls an extruder tip, pump for material and hopper. Current materials being evaluated are sand slurry and a form of playdough. The base for this unit is a commercial version currently under development by c-Link Systems. 3. A custom module for boring tunnels in the sand pile. What would mine craft be without the ability to build tunnels? This is actually the more complex of the three which is compounded even further by the physical size. The third portion of the project is the coupling of Minecraft to a translator package. In the case of an above ground building the building will have to be transferred to a solid model and further manipulated for 3D printing. Communication methods being used are already in play on commercial products. The whole scenario is based on a large pile of sand. If that is not available a large sandbox could even be used within the classroom, good for wither time in northern U.S. The sand is the working medium similar to the material in Minecraft. A large mound constructed with different density mediums would be of an epic configuration. Utilizing sand also allows for the end of year destruction so the new students in the coming year can start fresh. The overall project has enormous implications in how we use current games and tools to teach with. This whole project can be expanded 10-fold and still not reach a limit. The implementation is low cost with a high ROI but will take most schools time to learn how processes are organized. Allowing our young to experiment with hands on is the best path to understanding. Theories and facts can be memorized and regurgitated but that does not mean they are understood.